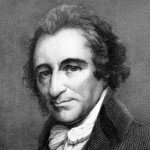 Thomas Paine (1737-1809) was a British-American revolutionary who contributed to events in France during the 1790s. Paine was British by birth, the son of a Quaker farmer from Norfolk. In 1774 he travelled to America, then on the brink of revolution, and acquired a reputation for writing political pamphlets that were as clearly written as they were radical. Paine’s 1776 republican essay Common Sense was one of the great tracts of the American Revolution and also became well-known in France. Paine returned to England in the 1780s, where he penned The Rights of Man, angering the establishment and leading to accusations of treason. In 1792 Paine fled to France, where he was given citizenship and elected to the National Convention, even though he spoke only a minimal amount of French. But while Paine was too radical for the British and many Americans, he was not radical enough for the rising Jacobins of 1793. Towards the end of the year he was removed from the Convention, by a decree banning foreigners, then thrown into prison. He spent almost a year incarcerated, narrowly escaping the guillotine before being released during the Thermidorian reaction of late 1794.